This fine recipe for a delightful stuffing would gladly grace any table or Christmas bird. The addition of the cranberries gives a nice fruitiness to mix. Whether in balls or bowls or stuffed into your turkey, don’t forget a good stuff and this one from BBC Good Food is certainly one not to be missed. Soak the cranberries in the port for an hour. Fry the onion and bacon gently in the butter, until the onion is tender and the bacon is cooked. Add the garlic and fry for another minute or so. Cool slightly, then mix with all the remaining ingredients, including the cranberries and port, adding enough egg to bind – I find it easiest to use my hands. Fry a knob of stuffing in a little butter, taste and adjust the seasoning if necessary. 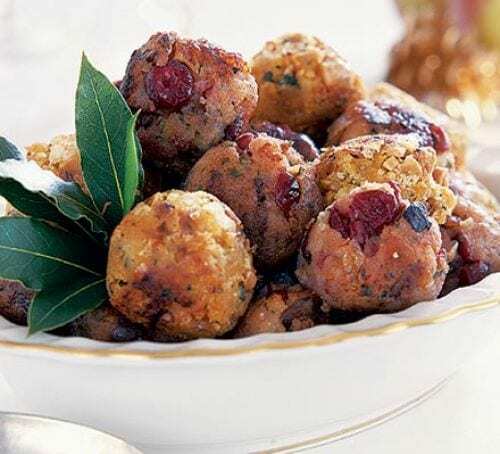 To Cook: This stuffing can be baked in a dish, or rolled into balls that will be crisp on the outside and moist inside. To bake, press the stuffing into a greased ovenproof dish in a layer that is around 4cm thick. Bake at 190C/gas 5/fan 170C for about 40 minutes, until browned and, in the case of sausagemeat stuffing, cooked right through. Alternatively, roll into balls that are about 4cm in diameter. Roast the stuffing balls in hot fat (they can be tucked around the turkey or done in a roasting tin of their own) for 30-40 minutes, until crisp and nicely browned on the outside. Always a favourite in our house to go with the turkey, this lovely slow-braised red cabbage. Sprouts at Christmas are enshrined in law, or at least they should be! We love our spruced up with a bacon and chestnuts with a glossy buttery sheen, mmmm. Call them pigs in blankets or sausages in bacon, no Christmas dinner can be complete without these seasonal staples. You got the glazed carrots, don't forget the other root vegetable favourite this year, the parsnip!